I decided to just go for it and give the circles a try. 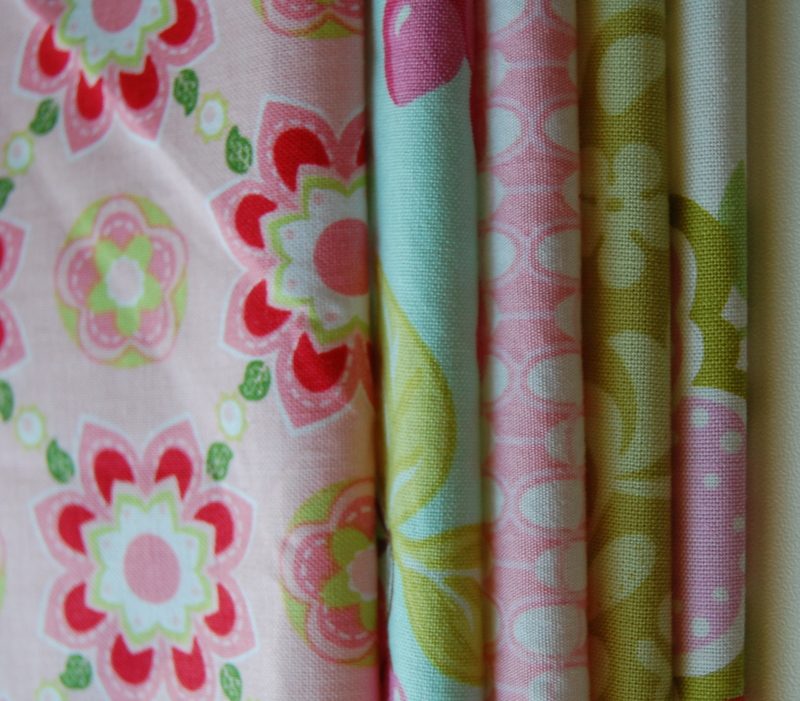 Then it sort of morphed into this great idea-I think- to make a baby quilt out of them. Not sure how/if they are going to make for a good baby quilt or not- fingers crossed!! So I picked some fabric I liked and got on the “circle bus”. The fabric on the left was given to me by the friend I’ll be giving the quilt to. She and her lovely family recently became foster parents to a beautiful baby girl. I’m happy to be able to include this fabric that I know she really likes and let it be my color inspiration for the rest of the quilt. It was fun making these little circles. That turned into little “frisbees” as my daughter called them. I’m still just playing with placement of the circles and I may need to add or take away some, but I really like how they look against the linen. I’m just not sure about how linen will work for a baby quilt. This is definitely an experiment. 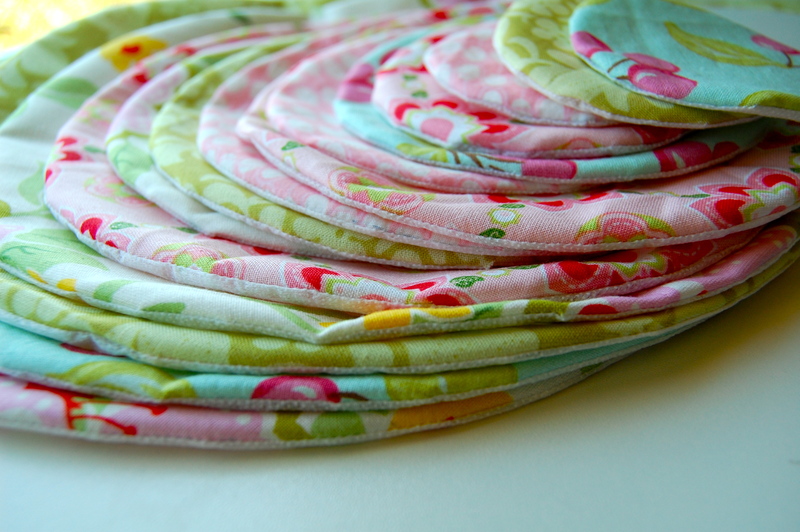 Have you ever used so much linen in a baby quilt? Was is cuddly enough? Well if it ends up being too “linen-y”, I think my daughters will love it. The “frisbee” quilt!! I think I’ll ponder this experiment for a bit and in the meantime I’ll work on this back up project. I have this sweet little knitted tank dress I’m working on. It’s my first time knitting this pattern. 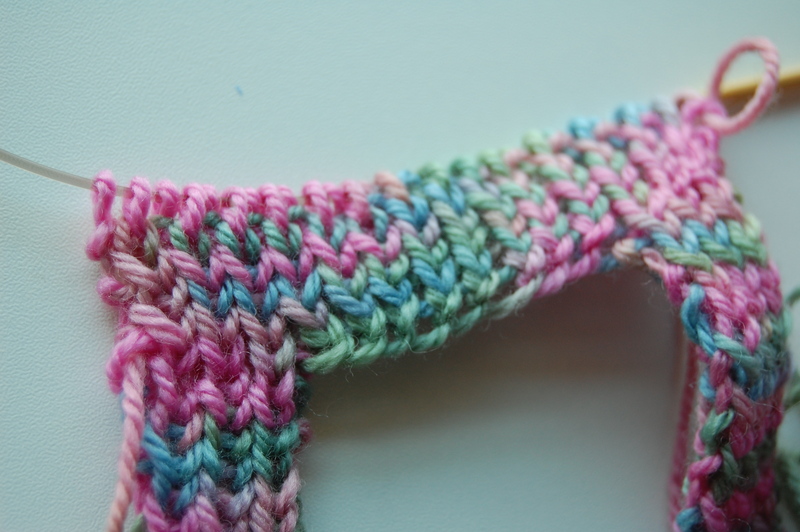 I figure it’s time to start expanding my knitting skills…. so far, so good. Thanks so much for the encouragement!! I’m definitely warming up to the idea. 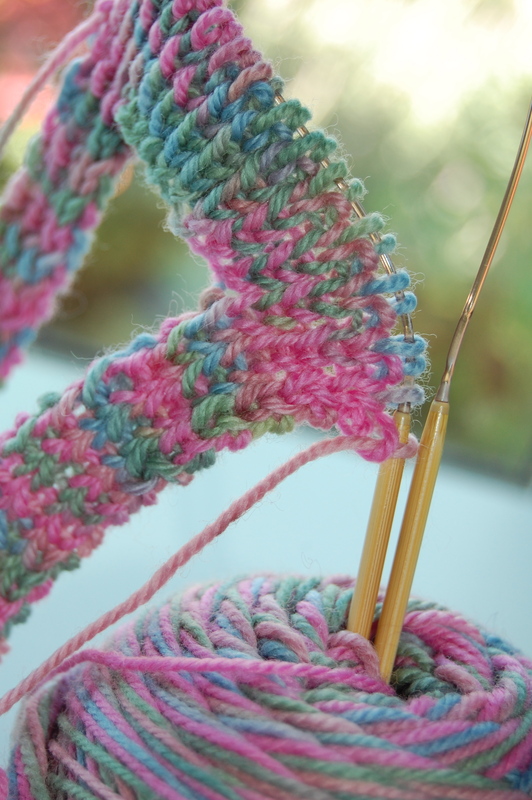 I used to crochet too- love that- but when I learned knitting, for some reason, I was hooked. OMG, So original! Quilted Circles! I love your idea, and I love your writing!! And knitting too? You’re on a roll. Cute circles! How do you plan to attach them to the body of the quilt? Will you fuse and machine applique or just machine stitch them down raw edge style? I think the linen will be just great, what are you backing the quilt with? Thanks! 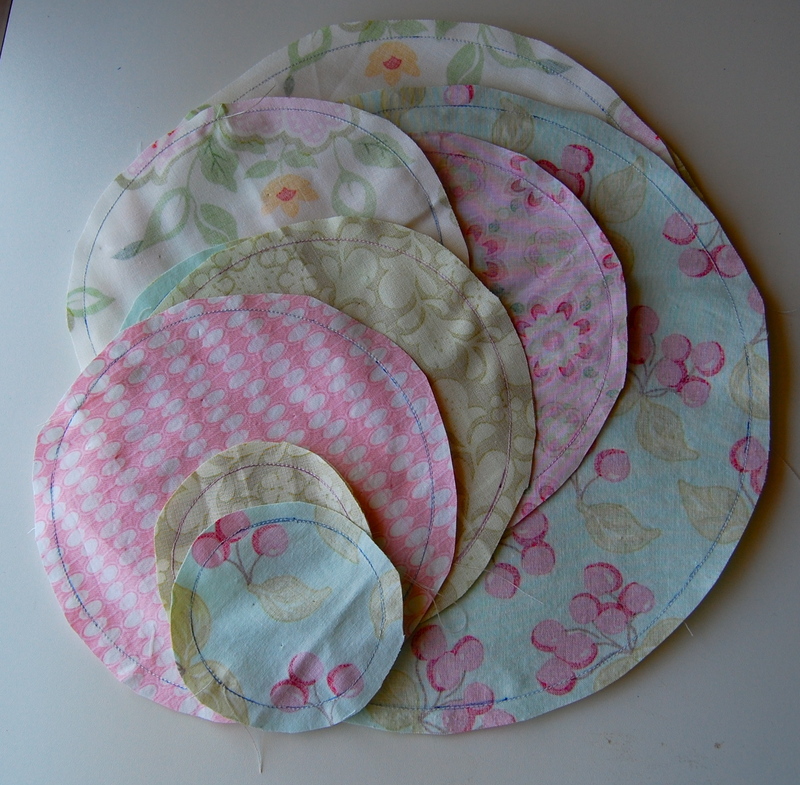 The circles have fusible on the back of them- see the tutorial for details, it’s a really neat technique. So I’ll fuse them on and then possibly free motion or hand-stitch around the circles. I love love LOVE the “frisbee” quilt! Such a great idea for a baby quilt, because it is both cute for baby, but something she can grow with as well! I like the layout you have pictured above as well! Thanks Krista!! I appreciate your earlier feedback too. I did a test swatch with the woven interfacing and yes indeed, it’s a bit too stiff. 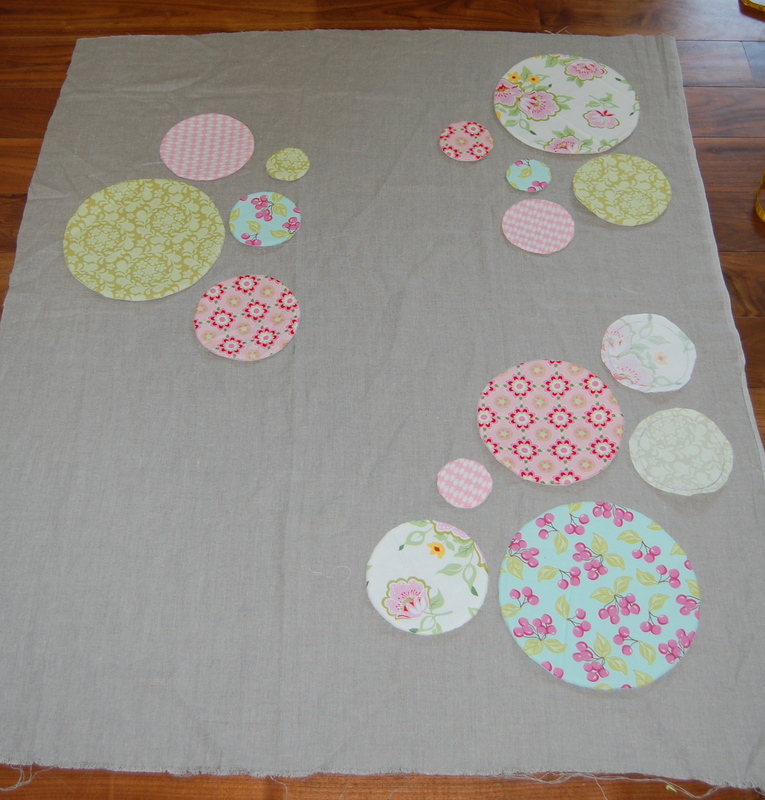 I’ll try adhering the circles first, basting and then free motion quilt the whole quilt. My linen is pretty soft so I think once it’s done and all washed up it’ll be great. So happy to have found your inspriation. Thanks again!